Rainbow Derby(G1) runner-up Hes Limitless will face All American Derby(G1) winner Hotstepper n Saturday’s 440-yard, $375,610 Texas Classic Derby (G1) at Lone Star Park. GRAND PRAIRIE, TX—NOVEMBER 7, 2018—Hotstepper and Hes Limitless are among the 10 3-year-olds entered back in Saturday’s 440-yard, $375,610 Texas Classic Derby (G1) at Lone Star Park. Hotstepper is a bay son of One Famous Eagle racing for Johnny D. Cope, R.D. Hubbard, Rafter W Stables, and Henry Southway. The gelding has earned $1,087,261 from 14 starts, and his five wins include a neck victory in the 440-yard, $1.239-million All American Derby (G1) at Ruidoso Downs on September 2. 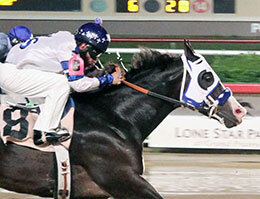 Hotstepper drew the rail post and will be ridden by Cody Jensen. Trained by John Stinebaugh for owner Jack Smith Farms, Hes Limitless made his local debut with a half-length victory in one of five trials on October 19. The homebred Corona Cartel gelding was coming off of a Ruidoso Downs summer campaign during which he ran second in the 440-yard, $802,000 Rainbow Derby (G1) at Ruidoso Downs in July, and was a finalist in the 440-yard, $1.239-million All American Derby (G1) on September 2. Hes Limitless drew post 6 and will be ridden by Agustin Silva. Other contenders include DF AJ Green Leaves, a sorrel daughter of world champion Apollitical Jess trained by Jimmy Padgett for owner Darling Farms. A finalist in the Rainbow Derby, the filly has earned $252,484 from eight starts this year, and her four wins include a wire-to-wire, 1 1/4-length victory in the 400-yard, $317,000 Remington Park Derby (RG3) for Oklahoma-breds at Remington Park in April. DF AJ Green Leaves drew post 7 and will be ridden by Rodrigo Vallejo.